Art Review: Anthony D. Sini, Second Floor Gallery, Firehouse Center for the Visual Arts, Burlington. Aunique suite of charcoal drawings by Anthony D. Sini is hanging in the Second Floor Gallery of the Firehouse this month. The drawings, most of them 32 by 40 inches, evolved from images the Burlington artist first captured in sketchbooks over the last two decades. He focuses on just a few haunts: Burlington, Block Island and Gloucester, Massachusetts. While his subjects hail from different places on the map, they’re all reflections of Sini’s creative landscape. He abstracts aging Victorian architecture, barges and streets into slouching aggregations of light and shadow that seem to convey the pith of whatever he surveyed. The word “value” in art isn’t about what things cost. It’s a formal term referring to light and dark. Finely controlled values are a major component of Sini’s creations. In addition, his works are primarily conjured from charcoal, the most basic drawing medium on the planet. Aside from his sparing use of the dust of ground-up chalk pastels — cerulean blue and burnt umber only — Sini’s works are monochromatic. The drawings range in value from the white of raw paper to an expressive scale of grays to the rich black of the unadulterated charcoal. Although Sini modestly claims he has no particular training in perspective, he certainly has an intuitive grasp of it. 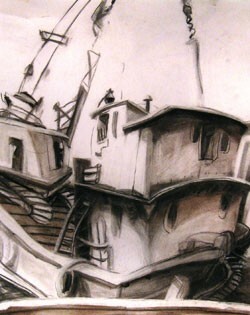 The drawing titled “Barge — Block Island” includes bending projections of the top of the careworn vessel. These appear to curve toward an upper vanishing point, resembling the complex principle of three-point perspective. The two tiers of the barge’s pilothouse slope downward, and a network of tilting stairs, such as can be seen in German Expressionist films from the 1920s, snakes around the vessel. Another drawing of a similar subject, “Barge Two, Block Island,” is a horizontal composition with a more complicated aggregation of portholes and segmented rhythms. Dark-valued lines of decking and steps along the lower half of the picture give way to broader areas of white above. Sini appears to have a fascination with rooftops, clapboards and decorative architectural elements. But there’s also a practical reason why he draws these cramped, modest structures. “Buildings don’t move, so it makes them easy to draw,” he said in a brief interview. “I want to make them move.” His effective, unpretentious brand of abstraction does exactly that. “Gloucester” is a vertical, 80-inch-tall diptych of crowded, sweeping forms brilliantly ascending toward a cupola and a more distant steeple high above. A closer-to-home portrait of the Queen City Park neighborhood is described in broader shapes. Triangles and rectangles coated in creeping shadows are layered deeply into the picture plane. Tall chimneys and a sagging wire appear in the upper reaches of the image. The most centrally located chimney contributes to a subtle vertical axis, enhancing the upward movement. Sini employed his crushed burnt umber chalk pastel on areas of “Queen City Park,” rubbing greater and lesser degrees of the dust into the paper to vary the values. Brown appears again in the sole monoprint of the show: Sini’s 11-by-17-inch “Leunig’s Alley” reprises the theme of a dynamically bent street scene. Since printmaking isn’t as free as drawing with charcoal, the artist has emphasized patterns that are defined with crisp lines. Jean Auguste Dominique Ingres (1780-1867) wrote of drawing: “To draw does not mean simply to reproduce contours; drawing does not consist merely of line: drawing is also expression, the inner form, the plane, modeling.” By that definition, Sini’s work epitomizes the most vital aspects of the art form.